Having a presale marketing plan for your fitness business is of the utmost importance. You want to make sure you start your business with a bang, not a sputter. There’s nothing worse than opening your doors on opening day and having no one walk in. What’s worse, if you only have a few members, they’re going to feel odd when they’re the only ones working out. You want that first week to be jumping with activity. Here are 4 steps to setting up a proper fitness business presale marketing and advertising plan. Every gym owner likes to think that their gym will attract everyone from the 18 year-old coed to the 75 year old grandpa. Sorry my friend, but even though you don’t want to believe this truth, you have to. Figure out your niche market and advertise towards them. If it’s college kids, you’re going to need to offer discounts. If it’s monied 20-somethings, you’ll need to offer convenience and the change to mingle with other attractive members. If you’re going for the older crowd, you need to balance affordability with convenience. Another benefit of figuring out the proper target market is that you can better allocate your marketing dollars. You don’t want to be advertising to anyone and everyone; you want to have a tight market and hit it hard. Just look at what DraftKings and FanDuel did with their marketing. There’s an old business adage, “It takes money to make money.” If you aren’t ready to spend a healthy amount of money on building your business, you might as well not even enter the game. Estimate that you’ll be spending around $1000/month on your advertising and marketing. That may seem like a lot, and it is, but unless you have a never-ending lease with a cheap landlord, you’re eventually going to have to start putting money in the bank. 100 members paying $50/month will easily cover your $1000 monthly ad budget. Give this spreadsheet a try to manage your expenses and figure out your marketing budget. Not everyone is going to want the same workout program. People loves choices and if you give them a nice selection, you’ll have happier clients. We suggest that you have 3-5 different options for membership. These can be monthly, weekly, bi-weekly, class-based, or whatever you like. Just give your members choice so they feel like they’re getting their money’s worth. That last thing you want to do is charge everyone $150/month and have people quitting after a month because they don’t feel like they are getting in shape for the price. It’s easy to create a marketing plan and then it fall by the wayside once you get your business up and running. Everyone loves to talk about how “busy” they are these days. Ask any friend you haven’t seen in awhile what they’ve been up to…”Oh man, I’ve been SOOOOOOO busy lately.” Don’t let that attitude slip into your business mentality. Create your advertising and marketing plan and then follow through. Make your ad spends and track the results. What’s you’re ROI looking like? How many legitimate followers do your business have? How many did it have last month? 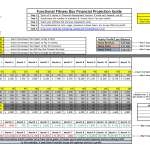 Track your results so you can see if your program is working.